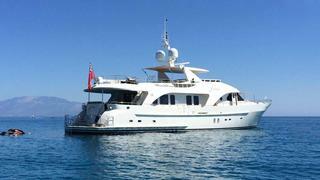 The 30 metre motor yacht Livadia, listed for sale by Arcon Yachts in Monaco, has had a €400,000 price reduction. Built in steel and aluminium by Dutch yard Moonen to Lloyd's class and MCA compliant, she has naval architecture by Diana Yacht Design and an exterior by Rene van der Velden with delivery in 2010. A beach house style interior by Art-Line accommodates eight guests in four cabins consisting of a master suite, VIP suite and two twins, all with entertainment centres and en-suite bathrooms enhanced by underfloor heating. In addition, there are quarters for four crew in two cabins with their own dedicated crew mess and galley. The saloon has large settees to port and starboard, two occasional armchairs, a coffee table, bar and an entertainment centre featuring a Samsung smart television screen. Forward lies a formal dining area with seating for eight guests. Great efforts have been made by the designers and the builder to provide the most efficient sound proofing system to ensure peace and quiet for guests both in port and underway. The designers of this yacht for sale optimised her for outdoor relaxation with a sheltered aft deck offering built-in upholstered seating, while the flybridge is suitably large, hosting a Jacuzzi tub, seating to port and a wet bar, barbecue grill and fridge to starboard. She also has a fixed aluminium Bimini top providing welcome shade. Like many of her Moonen sisterships, Livadia is fitted with extra large fuel tanks — 28,000 litres in her case — to give her a transatlantic range. Powered by twin 609hp Caterpillar engines, she has a range of 4,500 nautical miles at nine knots and is fitted with Naiad zero speed stabilisers. Lying in San Remo, Italy, Livadia is now asking €6,000,000.